There are lots of dogs that have mobility issues. In fact, some dogs are not even able to walk on their own. This can definitely be problematic for the dog and its owners. Just remember that mobility issues don’t mean that the dog’s life is over. There are ways to enhance the dog’s mobility and their overall quality of life. Buying a dog wheelchair is certainly one way to remedy the situation. However, you need to go to great lengths to ensure that you’re able to find the best dog wheelchair for your unique needs. Below, you’re going to find dog wheelchair reviews and tips for getting the right one for your dog. 1.2 When Should Wheelchairs For Dogs Be Considered? A paralyzed dog cart is pretty simple in reality. When your dog is equipped with the wheelchair, part of their body is going to be supported by the cart. The cart will feature wheels. When the dog’s other legs begin to move, the wheels will also move. This will give the dog the ability to continue walking around. No matter what type of dog mobility cart that you buy, you can pretty much guarantee that they’re going to work the same. It is vital to understand that a pet wheelchair is not going to be the solution for all problems. So, how do you know whether or not a wheelchair is going to be right for your dog? First and foremost, you should look for mobility issues. Is your dog having a tough time getting from one location to the next? Has the problem been long lasting? If you’ve answered yes to these questions, you should definitely get in touch with your vet. Speak with your vet to determine whether or not your dog needs a wheelchair. You should also attempt to perform the towel test on your dog. When you begin your search for a doggie wheelchair, you’re quickly going to discover that there are two types. Without learning a little more about the different types, you will never know which canine wheelchair is going to be right for your dog. Below, you will learn the differences between dog wheelchairs for back legs and front legs. If you’re looking for wheels for dogs, you will quickly discover that wheelchairs for back legs are far more common. Most dogs with mobility issues have trouble with their back legs. 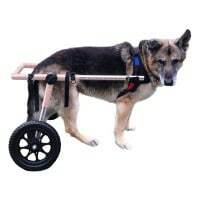 With this type of wheelchair, the wheels are going to be positioned near the dog’s back legs. They’ll use their front legs to push forward. This will cause the wheels to move. These types of wheelchairs are very helpful and they ultimately increase the dog’s mobility. If your dog cannot move his or her back legs, you should definitely give them more freedom by buying a dog wheelchair for back legs. These wheelchairs are far less common. However, they can be beneficial for dogs that have trouble moving their front legs. They’re almost identical to the dog wheelchair for back legs. The only difference is the fact that the wheels are going to rest near the dog’s front legs. When they move their back legs forward, the wheels will rotate and this will enable the dog to move around. Buying dog wheels for back legs or front legs is going to be tougher than you could ever imagine. 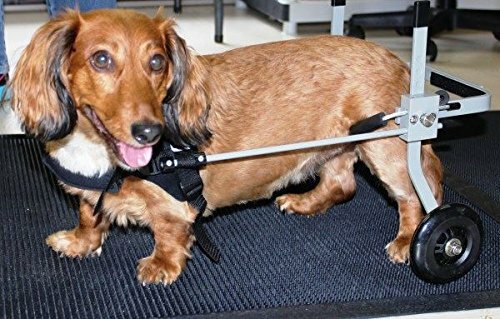 You need to pay close attention to a few key details to ensure that you’re going to be buying one of the top rated dog wheelchairs for your pooch. Below, you’ll learn more about the key features that need to be considered. All dogs are different in terms of size. Some dogs are huge, while others are very small. This is something that you’ll have to consider when attempting to find the best dog wheelchair for your pooch. You need to make sure that you choose a wheelchair that is going to match your dog’s specific size. Too big or too small is going to be a big problem. Take measurements if necessary. Either way, make sure that the size is perfect. Above all else, you need to make sure that your wheelchair is going to last. There is a good chance that your dog has many years left to live. The wheelchair needs to last for the remainder of his or her life. With that being said, you need to go to great lengths to ensure that you choose a high-quality wheelchair. Otherwise, it is going to break down pretty early on and it may become unusable. Do yourself a favor and buy the best wheelchair you can find. Make sure it is going to last for many years to come so you do not have to buy a new one in the near future. Dog carts for back legs and front legs can be somewhat heavy. This is something that needs to be taken into consideration when you attempt to buy a new cart for your dog. There is a possibility that you’re a bit older and this is going to make it tough for you to lift a heavy cart. Thankfully, there are carts out there that are lighter in weight. If you want to remove the burden from your shoulders and make your life easier, you will definitely want to buy a lighter wheelchair. This will make it much easier for you to load and unload the cart when it is ready to be used. 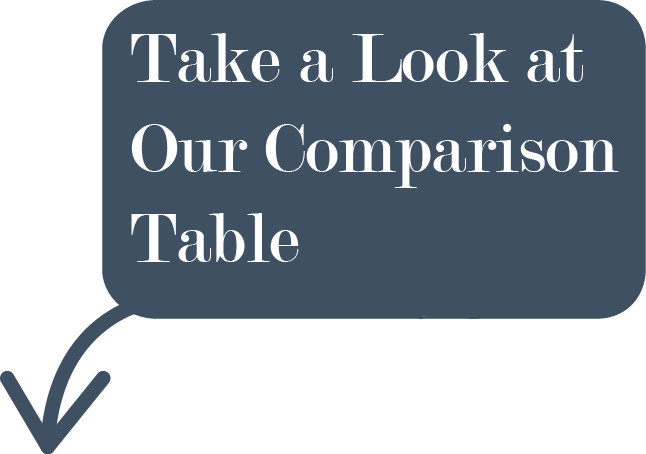 Finally, you should determine whether or not the wheelchair is fully adjustable. A fully adjustable wheelchair is going to be far more versatile and you might be able to use it for multiple dogs. You’ll also be able to get a better fit regardless of your dog’s size and weight. 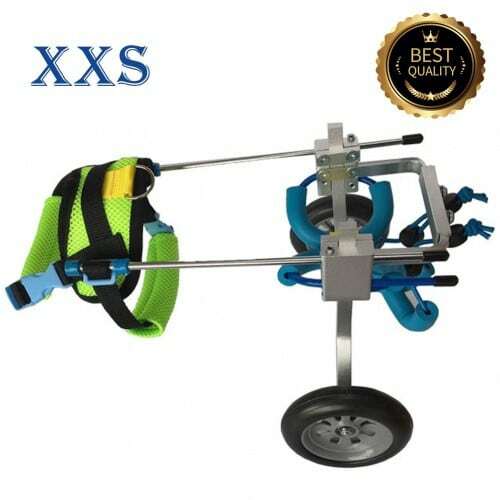 There is a good chance that you’re going to pay a little more for a fully adjustable cart, but it’ll prove to be well worth the extra money in the long run. There are plenty of great wheelchairs for dogs, but not all of them are equal. If you have a dog that is considered large, you will definitely want to spend a few minutes checking out the Walkin’ Wheels Dog Wheelchair. It is a little more expensive than the alternatives, but it’ll prove to be well worth the extra money in the long run. This product is suitable for dogs between 70 and 180 pounds. It can accommodate with 14 to 16 inch legs. So, what sets this wheelchair apart from the others? Is it really the best one for your dog? You’re going to find out in the review below. 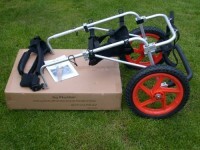 First and foremost, you should know that the Walkin’ Wheels Dog Wheelchair is built to last. Some are not and they’ll need to be replaced after several months of use. With the Walkin’ Wheels, this is something you won’t have to worry about. The aluminum frame is pretty lightweight, but it is still immensely durable. With this one, you shouldn’t have to worry about it breaking down on you any time soon. It should withstand the test of time no matter how often your dog decides to use it. You’ll also be happy to know that this is one of the most convenient wheelchairs for you and your dog. First and foremost, it is very stable. Once you have your dog strapped in, you won’t have to worry about them toppling over. The wheelchair is going to remain upright and ready to go at all times. It is also very easy to maneuver. Whether your dog is running straight or from side to side, the wheelchair should easily accommodate his or her moves. Another great thing about this chair is the fact that the harnesses are completely adjustable. You can adjust them to ensure that your dog is going to be comfortable from start to finish. The length, height and width of the chair is adjustable. There are few alternatives that offer this degree of versatility. Suffice to say, if you want to make sure that your wheelchair is going to fit your dog perfectly, you’ll definitely want to buy this one. You and your dog will not be dissatisfied in the least. Finally, you should know that this wheelchair is actually vet approved. It is a recommended solution for dogs that have limited or no mobility. If the dog’s hind legs cannot be moved freely, you’ll want to invest in this chair. It will give them the ability to move around freely without too much of a struggle. In fact, there is a good chance that your dog’s vet is going to recommend this wheelchair. That is a recommendation that you cannot refuse. 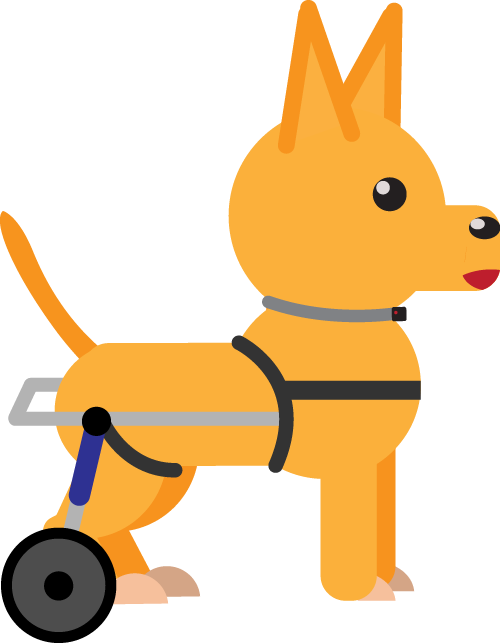 The Walkin’ Wheels Dog Wheelchair is great, but not perfect. There is always a risk that the wheelchair is going to collapse when your dog sits down. If that happens, they probably won’t get hurt. Nevertheless, it will be annoying for you and your pooch. Just keep and eye on it and make adjustments accordingly. Do that and you’ll love this dog wheelchair. Would you like to buy a dog wheelchair that is actually designed by a veterinarian? If the answer is yes, you’ll owe it to yourself and your dog to check out the K9 Cart Original Dog Wheelchair. This is one of the few wheelchairs on the market that is actually designed, built and tested by vets. It has been in the process of design and manufacturing for more than 53 years. At the same time, this product is made in the United States. This combination pretty much ensures that you’re going to get your money’s worth. If you want a wheelchair that is going to last, you’ll love this one. Another thing to note is that this is one of the lightest wheelchairs out there. Some wheelchairs are too heavy and that can be a big problem for you. After all, you have to lift it up and stick it in your trunk when you’ve finished using it. That can be a real hassle with a heavy wheelchair. With this one, you’re not going to have a problem whatsoever. Even with the biggest model, you shouldn’t have any problem whatsoever loading or unloading this chair. It is also great to know that this wheelchair is made using the highest quality aircraft grade aluminum. This guarantees that this wheelchair is going to last a lifetime. Even if you use this wheelchair every day, you can rest assured knowing that it is going to serve your dog for the rest of his or her life. Finally, you should know that this wheelchair is available in numerous sizes. You can choose sizes ranging between extra small and large. This ensures that the wheelchair is going to accommodate pretty much every dog out there. Your dog is going to require some time to adjust to this wheelchair. Other than that, it is well worth the investment. Just remember to be patient and you’ll love it! There are some large dog wheelchairs that are overly expensive. If you want a good one that won’t cost too much, you’ll definitely want to check out the Dog Wheelchair from Best Friend Mobility. It is moderately priced and it is certain to last a lifetime. After all, it is made with an aluminum frame that will never rust. The galvanized hardware will never rust either. This combination helps ensure that you’re going to get your money’s worth in the long run. Another great thing about this wheelchair is the fact that it is adjustable. You will have no trouble whatsoever adjusting the length and the height. If you want to make sure that your wheelchair is going to fit your pooch perfectly, you’ll definitely want to invest in this one. Just use a hex wrench and you’ll have it adjusted in a matter of minutes. Overall, the Best Friend Mobility Wheelchair is definitely worth the investment. It is lightweight, easy to use and affordable. For the price, it is hard to beat. The HiHydro is a unique wheelchair that is great for almost all dogs. It is a good choice for dogs that have trouble their hind legs. If you want to give your dog the freedom to walk or run, this is the wheelchair for you. It offers maximum maneuverability so your dog won’t have any trouble whatsoever using it to get from one location to the next. The wheelchair is incredibly lightweight. This makes it a good investment for you and your dog! Some wheelchairs are very difficult to put together. This is not going to be a problem with the HiHydro Pet Wheelchair. It is very simple and easy to assemble and disassemble. If you want a wheelchair that is going to be convenient for you and your dog, you cannot ignore this one! The HiHydro Wheelchair is pretty amazing. It works great most of the time. Just remember that the fasteners may come loose. With that being said, you need to be prepared to tighten them constantly. Some dog wheelchairs are only suitable for bigger dogs. If you have a small dog, you will definitely want to check out the Huggiecart Dog Wheelchair. 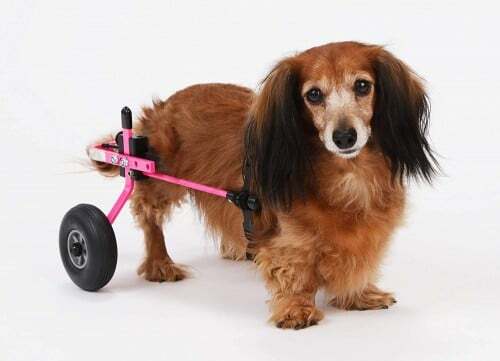 This wheelchair is designed for dogs that have a body type like a dachshund. The lightweight frame will make your life easier, while ensuring that your small dog has no trouble whatsoever moving the cart around. It is basically designed for dogs weighing between 9 to 18 pounds. It is great that this wheelchair is adjustable. The neoprene harness is very comfortable for your dog. At the same time, the wheelchair is adjustable in terms of weight, length and height. If you want to give your dog the best fit, this is the wheelchair that you’ll want to buy for your dog. Just remember that this one is only suitable for dogs up to 25 pounds. This is really the best dog wheelchair for dachshunds. It works great, but it will take your dog some time to accommodate to. As long as you give them time and you remain patient, you’ll love this wheelchair and your dog will too.